Depending on whom you ask, and when, the Oslo Accords—the 1993 agreement between Israel and the Palestine Liberation Organization, famously sealed with a handshake on the White House lawn by Yitzhak Rabin, the Israeli prime minister, and PLO chairman Yasir Arafat—either helped the parties advance toward peace, paved the way to further Palestinian ruin, or imperiled Israel’s very existence. The Declaration of Principles, as the document was officially called, wound up being as open to competing interpretations as, well, every other aspect of the Israel-Palestine conflict. (I’ll fess up at the top: I’m in the camp of option B, maintain a sliver of irrational attachment to A, and file C under “hysterical fabrication.”) About one aspect of the agreement, however, there is unanimity: How it came to be is one helluva story. A half-dozen Palestinian and Israeli negotiators hashed it out secretly over nine months, meeting periodically in Norwegian hideaways. Meanwhile, the official talks limped along the road to nowhere without any of their participants—not least their sponsor, the United States—having a clue that a parallel process was under way in the countryside around Oslo. Several of the players in the back-channel talks wrote memoirs about the experience; other writers have reconstructed the events through extensive interviews. Scores of analysts across the political spectrum have written books about the accords themselves, their choppy implementation and bloody aftermath. Now the playwright J.T. Rogers has added Oslo, an engaging three-hour drama chronicling the covert conclaves. It’s currently running at Lincoln Center Theater in a crisp production directed by Bartlett Sher. Rogers did considerable research and interviewing to build the play. He grabs colorful details from some of the memoirs: Israeli Foreign Minister Yossi Beilin’s assertion that his stomach can’t handle anything spicier than gefilte fish, the bad jokes the negotiators regale each other with. But of necessity, Rogers invents the dialogue and condenses events (reducing the number of Palestinian negotiators, confining the meetings to a single location). Still, he does not veer from the essential action: the incremental progress from grandstanding to deal-making as the wary negotiators warm to each other. Rogers picks up the story when a married couple—Terje Rød-Larsen, director of an applied-science institute, and Mona Juul, a Norwegian Foreign Ministry official—offer to host the sessions. (Rogers credits the pair with the initiative, but two Israeli economics professors, at least according to their own accounts, were already testing the waters with the Palestinians and seeking an international sponsor for the clandestine meetings, a call that Rød-Larsen and Juul answered; meanwhile, the PLO’s finance minister, Ahmed Qurie, was also seeking avenues for direct discussions.) The couple provides the playwright with a framing device: They’re the observers through whose eyes we enter the events. More than the PLO delegates’ longing to return home from exile, more than both sides’ determination to end the violence, the couple’s stakes—keeping things going, keeping things secret—drive the dramatic action. Rogers deftly ratchets up the tension as Norwegian officials periodically try to put an end to the meetings; as the press catches wind of them; and as the Israeli team gathers new members, each more obstinate than the last. Juul (played here by Jennifer Ehle) serves as a blunt narrator, often directly addressing the audience with scene-setting details (“January 1993. The official opening of the unofficial Oslo channel. From here on, everything else that happened, everything you will see, took place in only nine months”) and contextual info (“March 1993. A Palestinian youth in Tel Aviv kills two Israelis. In response, Prime Minister Rabin seals Gaza, forcing 30,000 inhabitants out of work”). Place shifts seamlessly on an elegant unit set, designed by Michael Yeargan for the Mitzi E. Newhouse Theater’s three-quarter-round space. An upstage set of double doors is as symbolic as it is functional. Even 23 years ago, anyone who really looked at the Oslo Accords saw how unlikely a two-state solution was. Rød-Larsen’s suggestion that successful negotiations require that the participants be revealed in all their complex dimensions is also a pretty good rule for narrative dramaturgy, but Rogers isn’t always up to the task. While he’s masterful at developing structure and creating suspense, he is less successful at building convincing characters. Rogers paints the Palestinian team member Hassan Asfour (Dariush Kashani) as a gruff, doctrinaire communist—though, in fact, Asfour had retreated from communism by the time of the Oslo meetings—whose primary modes of expression are pouty silence and rhetorical shouting (except when Asfour has lines like this one, praising the cook at the castle where they’re staying: “Comrade Toril is to food as Vladimir Lenin is to land reform”). The nimble cast, with 14 actors playing 21 roles, squeezes as much humanity from these broad-stroke traits as possible. Ehle and Mays, in particular, find layers of affection, anxiety, and assurance in quiet gestures and intimate glances that, through the force of their acting alone, nearly provide a subplot about the course of the characters’ marriage. It was by meeting Rød-Larsen and Juul that Rogers became interested in the Oslo negotiations. He was introduced to the pair by Sher, the play’s director, who knew that Rogers would leap at their story. At the time, Sher and Rogers had just finished working together on Blood and Gifts, a play about the US war in Afghanistan, presented at Lincoln Center in 2011. Rogers is also the author of The Overwhelming, which places a clueless American family in Kigali on the eve of the Rwandan genocide. Those plays are also packed with historical information that Rogers metes out handily in the flow of the action, using the device of a naive protagonist as a stand-in for the audience. In Oslo, however, Rød-Larsen and Juul are on a somewhat more clear-eyed mission to change the world. But like the earlier works, Oslo left me uneasy for reasons that go beyond Rogers’s considerable skills as a dramatist. These plays feel cold and strangely apolitical as, in the end, they strike a pose of careful neutrality. In Oslo, the process of making the sausage is the play’s only concern; how it turned out is rendered irrelevant. That’s undoubtedly why those who regularly protest plays that express Palestinian views have made no complaints about this one. Having reported on the Israeli-Palestinian conflict from the late 1980s onward—and having attended the Oslo Accords’ signing on the White House lawn that sunny September day in 1993—I couldn’t help but wonder what might be gained, apart from an evening’s ennobling entertainment, by retracing the steps of these meetings. Even 23 years ago, anyone who really looked at the Declaration of Principles saw how unlikely it was to lead to a two-state solution. The agreement provided that, after withdrawing from the occupied territories, Israel would retain responsibility for both external and internal “security”—that is, it could still demolish homes, detain people without charges, expel Palestinians to other countries, and whatever else it wanted, as long as it was done in the name of security. The document contained no statement that settlement building would stop. Meanwhile, the Knesset passed the agreement with a less-than-rousing endorsement—61 to 50, with eight abstentions—and before the ink was dry, Bibi Netanyahu, then head of the Likud party, vowed that no Likud government would ever honor an accord with the PLO. He stayed true to that promise when he was elected prime minister three years later. Hamas and the other rejectionists on the Palestinian side returned the favor. Meron Benvenisti, former deputy mayor of Jerusalem, told me then that his country had merely shifted to “occupation by remote control.” Even so, it was thrillingly clear in 1993 that the Oslo Accords had achieved one stunning advance: mutual recognition. It seemed at the time, at least, that there could be no reversing such a paradigm shift. But what enabled it? Not just bonhomie, booze, and delicious waffles. 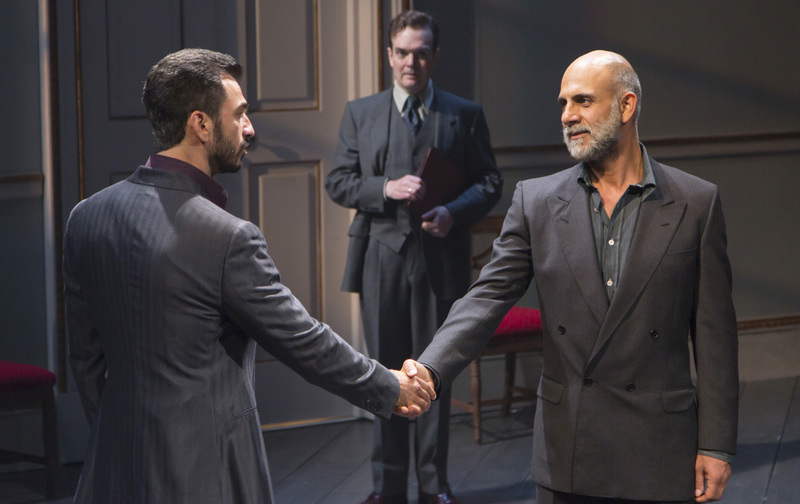 In his play, Rogers doesn’t investigate how the negotiators struggled internally not only to see the enemy as human, but also to question their own self-serving national assumptions. Maybe that’s impossible to dramatize. But it’s what we desperately need to know now.